Reprint. Originally published: London: Viking, 1978. Board book. 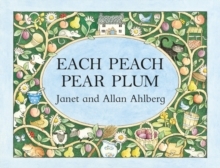 A beautiful brand new cased board book version of this classic picture book by the iconic Janet and Allan Ahlberg. Each Peach Pear Plum introduces characters from well-known nursery stories, such as the Three Bears, Mother Hubbard and Tom Thumb, and encourages children to participate and to find the characters hidden in the pictures. The text, with its strong rhyme and rhythm, is perfect to read aloud to very young children, while the game of 'I Spy' keeps children enthralled.